We were planning on just throwing some steaks on the grill for a quiet “Date Night” dinner. 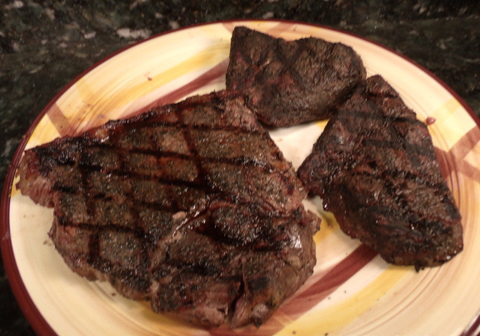 We gave the steaks a nice dusting of Marty’s Tatonka Dust, it is like a blackening seasoning, nice and smoky. As a side made a cold green bean salad to go with our steak fries and steaks. We added a little zip to the fries with some of Pete’s Firehouse rub, original. We are just going to talk about the steaks tonight. 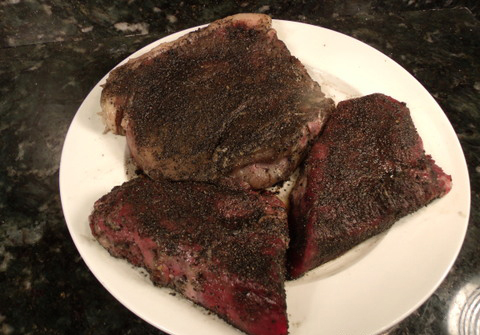 Rub your steaks down with a dusting of Tatonka Dust and let them come up to room temperature. Now, just let them sit in the smoke for 30 minutes or so. This adds layers of flavor and still lets the flavor of the steak sing. You want your seasonings to compliment your food, not overpower. 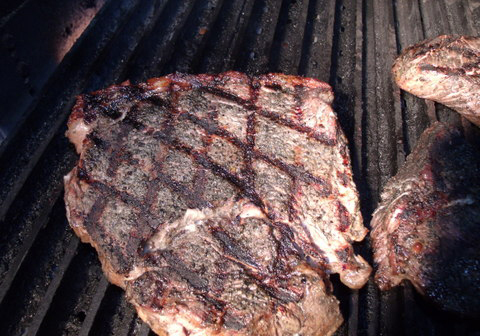 After 30 minutes pull your steaks off the grill and turn your Green Mountain Grill up to 500 degrees (260c) and let your grill grates get hot. I did these guys at 4 minutes per side with a quarter turn halfway through. Beautiful. I like to pull our steaks around 130 degrees (55c) nice and rare. To prepare the grill for cooking, check your pellet supply – top off or change flavors as needed. Scrape grill grates off. Turn the grill on and “Start” the cooking cycle. Give the grill about 15 minutes to reach temperature and the grates to burn clean. We like to smoke everything for at least 30 minutes with an hour being even better. After all the Green Mountain Grill is an awesome smoker. So use it for all the wood smoke flavor it will add to your food. After the grill comes up to temp and burns clean turn it back down to 160 to 180 degrees (84 to 95c). Place everything directly onto the grill and just let it hang out in the smoke and get happy for 30 minutes or so. This is referred to as “Smoking” or “Hot Smoking”, the temperature is 180 degrees (84c). 30 minutes of smoking is not enough to have any cooking effect on your meat but it is enough to open the pores so that the meat can pick up all the flavor of the smoke. 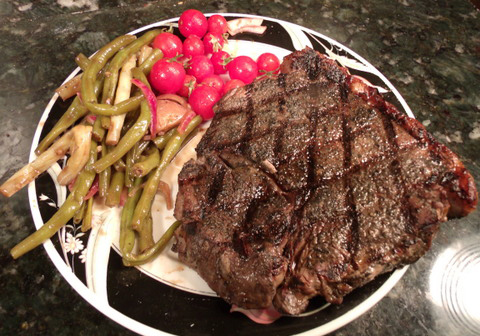 After 30 minutes, turn the heat up to 500 degrees (260c) and pull the meat off the grill. When the grill comes up to temperature put your meat back onto the grill. I did this for 4 minutes per side with a quarter turn halfway for those nice grill marks. Perfect. When the meat reaches an internal temp around 130 (55c) pull it off, cover it and let it rest for 10 minutes before serving. This will be medium rare. Keep in mind that the meat will continue cooking for another 5 – 10 degrees after you pull it off the grill. So for medium pull it at 140 (60c) and overdone 160 (72c). I use a Maverick ProTemp Instant Read Thermometer for checking meat temperatures.